Drivers will face significant congestion on major roads from Wednesday onwards as the Christmas getaway starts. 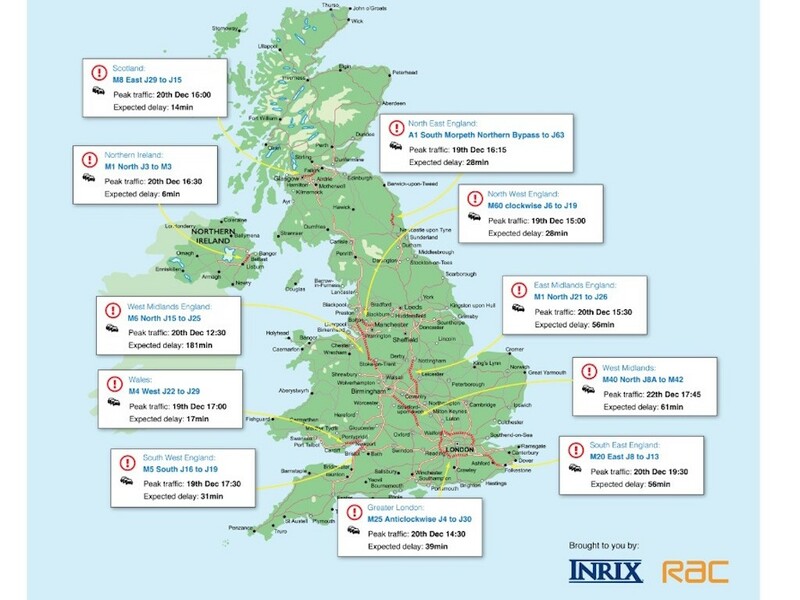 That’s the warning from the RAC and Inrix as they warn that as many as 20 million individual Christmas leisure trips will take place this week in the run-up to Christmas. The firm’s joint research suggests a staggered spread of getaway traffic throughout this week, peaking towards the weekend as larger volumes of everyday commuter traffic combine with people breaking up for Christmas. As a result, this Thursday (20th) and the festive but ‘frantic’ Friday (21st) are likely to mark some of the worst days, with 2.5 million and 2.8 million individual journeys expected to be taken respectively. 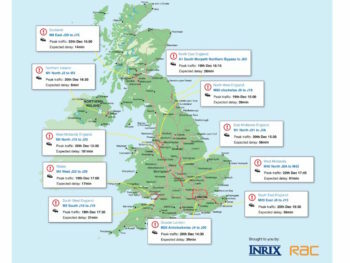 The worst-hit motorways will be the M25, M6 and M40, which are all likely to face long delays in the second half of the week according to Inrix data. On Thursday, delays of up to three hours are expected on one section of the northbound M6, while on Friday part of the southbound M40 could see drivers queuing for more than an hour and a half. However, when it comes to pure leisure journeys over Christmas, traffic is likely to peak on Boxing Day when some 6.8 million individual trips will be made as drivers cross the country to see family and friends, followed by Thursday 27th December when 4.4 million journeys are expected to be taken. The anticipated jams will be compounded by extensive disruption to the rail network – both planned and unplanned – that could force more people onto the roads. For further details of the days and roads expected to be worst affected, click here.